Making sure you buy the right boiler for your specific needs will keep you comfortable for years to come while keeping your energy bills low. There are many factors that go into selecting the right boiler, so use this guide below to learn more. If you need help, you can always call us for assistance. 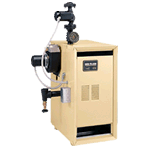 Boilers are typically available for either steam or hot water applications. Before moving forward with selecting a boiler, it is critical to determine which you need for your home. If you are unsure which type of boiler you need, we suggest having a professional determine the system type. However, there are clues you can look for to determine if you need a steam or hot water boiler. It is also important to check how many pipes are connected to your radiator. Systems that have just a single connection to the radiator are almost always steam, while those with two-pipes could be either steam or hot water. If your home has radiant floor heat, it is almost certainly a hot water system. If after inspecting the radiators you are still uncertain about the type of your system, you will need to inspect the boiler. Steam-fired boilers will have a small glass tube, called a sight glass, mounted on the side of the boiler. This sight glass is intended to show the level of water inside the boiler. Hot water boilers will not have a sight glass, but are likely to have other accessories installed nearby, such as a pump or expansion tank. In some rare instances, especially with very old systems, a hot water system may not have a circulator pump, and the expansion tank may be located in the attic. If upon inspecting both your radiators and boiler you are still unsure about what type of system you have, please contact us or call a professional to inspect the system. 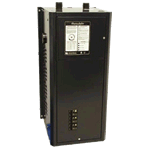 There are a variety of fuel options available to power your boiler. These include natural gas, liquid propane (LP), fuel oil, and electric. Natural gas is the most common fuel, especially in urban areas. You will most likely need a natural gas boiler if you have gas pumped to your home from a utility main and receive monthly bills for the amount of gas used. In areas without a natural gas supply, propane is the next most common fuel. Propane is usually stored in a tank on the property where it will be used. This tank can be located either above or underground. Typically, you will need to have propane delivered a few times per year. 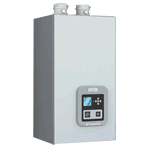 Many natural gas boilers are convertible to propane, and vice versa, with an appropriate conversion kit. Canada. As with propane, there will be a tank located on the property, and periodic fuel deliveries will be required. In rural areas that have available wood, coal, or other biomass, solid fuel boilers may be an option. These boilers need to be manually loaded whenever heating operation is required. They can be a huge source of savings in areas where the necessary fuel is available. Often an oil, natural gas, or propane boiler will be installed alongside a solid fuel boiler to supply heat when no one is available to load fuel. 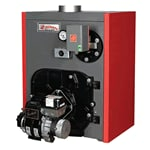 Electric boilers are an option where other fuel types are unavailable or prohibitively expensive. Electric boilers are also useful for handling small applications such as adding heat to a garage. An important part of any boiler system is to eliminate combustion gasses resulting from burning your fuel. The three main vent types available are chimney venting, power venting (direct exhaust), and direct venting (sealed combustion). Choosing the correct option for your home depends on your existing boiler, your home’s construction, and the efficiency you want from your new boiler. As their name implies, chimney vented boilers reject spent combustion gasses through a vertical chimney. Each boiler will have specific requirements with regard to the size, height, and construction of the chimney. Only by having a qualified professional inspect your chimney can you determine whether it is suitable for a particular boiler. Chimney venting relies on the principle that hot air is less dense than cool air, making it naturally buoyant. This hot, buoyant air travels up the chimney while fresh air for combustion is pulled into the boiler to replace it. Because this is a passive process (i.e. there is no motor forcing the hot air out), any obstruction in the chimney or an inadequate supply of fresh air will likely result in improper operation. This could potentially lead to a fire or to carbon monoxide entering the home. For homes without an existing chimney, or homes where the existing chimney is in dis-repair or inappropriate for the necessary boiler, power venting could provide a reasonable alternative. Power-vented boilers, also called direct exhaust, use a built in blower to pull fresh combustion air in to the boiler and push spent gasses outside. The built-in blower gives you the flexibility to vent through a sidewall or through the ceiling without needing to use a chimney. Also, because the air is being actively forced through the boiler, the vent piping used is substantially smaller than what is needed for chimney venting. Because power-vented boilers still draw combustion air from inside the home, it is important that there is an adequate supply of fresh air to ensure proper operation. 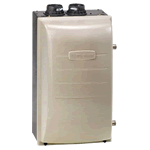 Direct vent boilers, also called sealed combustion, are ideal for modern tightly sealed homes. Chimney and power vented boilers pull air from inside the home for combustion and exhaust it afterwards. Unless there is a way for this exhausted air to be replaced, the boiler will not operate correctly. Also, even if the air is replaced, you will likely be pulling cold un-conditioned air into your home. Direct vent boilers pull air for combustion directly from outside the home, and exhaust it back outside. This means the entire combustion process is “sealed” from the indoors, and you are not exhausting air you had already heated to the outdoors. Because they do not rely on indoor air for operation, direct vent boilers can often be installed in a closet or other confined space. They can be exhausted through either a side wall or ceiling, and use venting of a similar size to power vented boilers. Power and direct vented boilers must be vented directly to the outdoors. They cannot be used in common vent systems with chimney vented appliances, and cannot exhaust into a chimney. Boilers are typically available in efficiencies ranging from 80% - 96% Annual Fuel Utilization Efficiency (AFUE). A boiler's AFUE rating is an estimate of what percentage of the fuel used by a boiler is converted into usable heat for the home. By comparing AFUE ratings, you can get an idea of how much a boiler may cost to operate. Boilers with an efficiency rating of between 80% - 84% are commonly termed standard efficiency. Most boilers in this range use a cast iron heat exchanger and chimney venting, but power-vented and direct-vent models are available. Boilers in this range are designed so as to meet federal minimums for efficiency and are generally not eligible for any rebates or incentives. However, they are relatively inexpensive and use commonly available vent materials. Due to their proven design and construction, there is little to separate boilers in this range from each other. Choosing a boiler that is correctly sized and one with which your installer is familiar is the best way to ensure efficiency and reliability from standard efficiency boilers. Many manufacturers offer “High Efficiency” versions of their chimney-vented standard efficiency models. These are boilers that have had their firing characteristics slightly modified so as to achieve AFUE ratings of over 85%, often sacrificing output and increasing cost in the process. 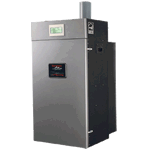 The purpose of these boilers is to qualify for incentives and rebates offered by certain utilities and localities. In addition to the increase in upfront cost, these 85% AFUE boilers often require use of costly stainless steel venting materials. We suggest avoiding these special purpose boilers unless there is a rebate available in your area to offset the increased cost. True high-efficiency boilers are those with an AFUE rating above 90%. Boilers in this range typically use stainless steel or aluminum heat exchangers for the best balance of efficiency and longevity. Nearly all high-efficiency boilers are direct vented, although some are convertible to power vented operation. Venting materials are less common than for standard boilers, but are still less expensive than the stainless steel often required for 85% AFUE models. High-efficiency boilers have a higher upfront cost and more stringent installation requirements than standard options, but can offer operating cost savings of up to 30% and a reduced impact on the environment. High-efficiency boilers take advantage of a process called condensing to maximize the amount of heat they are able to deliver to your home. This takes advantage of the chemistry of the combustion process and the energy released by condensing water vapor into liquid water. While condensing boilers are often 10% more efficient than non-condensing models, they are better suited for some applications than others. Condensing boilers have only recently become a common alternative to non-condensing models in the boiler marketplace. 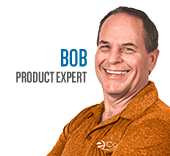 As such, the most common systems in use today, such as ones using cast-iron or baseboard heaters, are not designed to maximize their benefits. This is because these systems were designed to operate with high temperature (~180° F) water, and the efficiency of condensing boilers is maximized with water temperatures less than 140° F.
Condensing boilers will work with high-temperature systems and still be more efficient than conventional boilers in such applications, but some of their benefits will be lost. Newer system types, such as radiant floor or panel radiator heating systems, are better suited for use with condensing boilers. These systems, especially radiant floor, use lower temperature water, which maximizes the efficiency of condensing boilers. Non-condensing boilers can be used for these types of systems, but will often require a mixing device to temper water to the appropriate temperatures. Condensing boilers are a more efficient option than non-condensing models, regardless of the application in which the boiler is being used, but their benefits are maximized when they are used in a system that was designed to operate with lower water temperatures. than a non-staging, on/off boiler. Modulating is a control method where a boiler can produce any output between a defined minimum and maximum level. 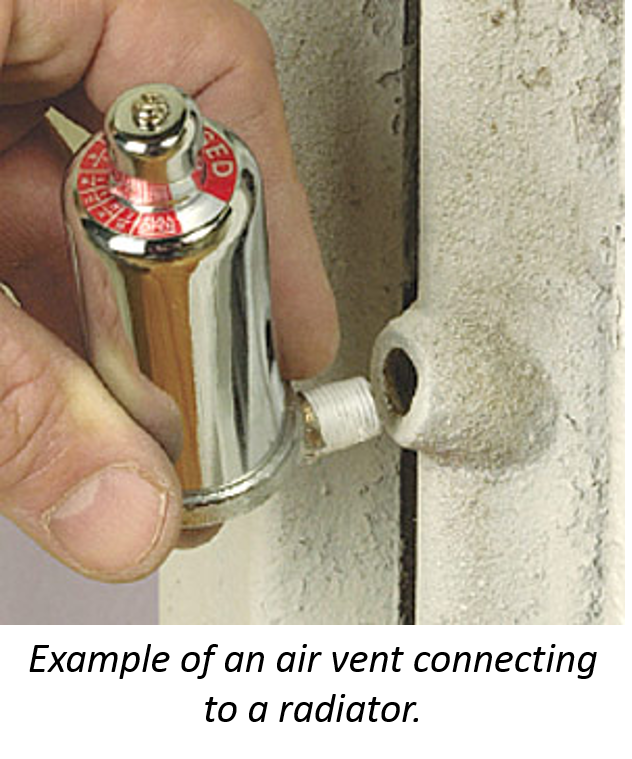 This gives you even finer control than is possible with a staging boiler, and results in constant, even heat. By continuously adjusting to your home’s heating needs, a modulating boiler is able to maintain a nearly constant temperature and reduce fuel usage significantly. While staging is rare in residential applications, modulating controls are often built into high-efficiency condensing boilers. By combining these two energy-saving technologies (along with other sophisticated control methods), modulating, condensing, high-efficiency boilers offer unparalleled comfort, performance, and efficiency. Even with modulating and condensing technology, a boiler can’t offer consistent, efficient comfort if it is not sized correctly. If you are replacing a boiler that you were comfortable with in the past, it's likely you could simply replace it with a boiler of the same size. However, proper sizing of heating equipment is a complicated science, so it is best to have a professional, such as one of our degreed engineers, compute the sizing for you. To get a better idea of what goes into sizing a boiler and why it is so vital, see our informational article on the topic by clicking the link below. Read "The Why and How of Sizing HVAC Equipment"
Boiler Buying Guide - How to Pick the Perfect Boiler. Our heating, ventilation and cooling equipment how-to library can help you pick the perfect comfort solution for your home.